Ashes of Time: a period drama from Hong Kong’s current it-boy auteur, full of drama and adventure and style and stylization, enigmatic and non-linear, with an ensemble of hyper-cool Hong Kong acting talent. Director Wong Kar Wai has made some beautiful films, including In the Mood for Love, a nostalgic platonic love story with a soft touch; 2046, a retrospective on failed romance; companion films Days of Being Wild and Chungking Express; and his most recent, an American travel saga called My Blueberry Nights, starring Jude Law and Nora Jones. Wai comes from a graphic design background, and his movies are all delirious blurs of city lights, reflections, and slow motion. They’re also famous for their slow, wistful sentimentality and open-ended plot arcs and relationships. Wong Kar Wai revels in the power of the vivid image, and his characters coast quietly and sadly through his stylized worlds. For a fairly recent movie that flew a bit under critical radar, Ashes of Time has generated a good bit of online discussion and interpretation, largely from the director himself. A fairly comprehensive overview and analysis can be found in the online Press Kit, which may help you sort out the complex and ambiguous plot, if you don’t want to tackle it yourself. Another site has an excerpt from a magazine interview with Wong Kar Wai, wherein he discusses the relationship between Ashes of Time and some of his other work. In particular, he likes to discuss the Jianghu, the imaginary alternate Earth where the classic Wuxia hero stories tend to take place… a world envisioned in the breathy close-ups and epic landscapes of Ashes of Time. This world – Wong Kar Wai’s Jianghu – is a garish yellow-and-blue universe of empty-space compositions, where a landscape is defined by a horizontal horizon line and a single tree. It's a gilded world, impressing itself aggressively on the senses, and this gives the landscape and its characters an alkaline sensory edge, keenly lucid and immersive. Christopher Doyle's cinematography adds to this effect, focusing our attention on facial expressions, single gestures, and the most minute details of the visible landscape. Even in the close-ups and action sequences, the visuals are dominated by solar yellow, harsh light, and overexposure. The first shot of Ashes in Time Redux, which was apparently added for this re-cut, sets the stage for the sensory mode that Wong Kar Wai establishes. Looking into the sun through dust clouds, we can imagine our eyes burning, and they seem to keep the radiant after-image of that sun for the whole film. This heightened reality supports a madly complex narrative that follows the interactions of at least seven major characters (I'm counting Feng, Yaoshi, the blind swordsman, Huang, Murong, Feng's lost love, and the girl with the donkey and the eggs). Their stories are entangled in a chronology that's challenging and non-linear, although as far as I can tell, it's not self-contradictory. To make the situation even more complex, many of the characters are connected by parallel themes... the fight with the bandits, the lost love of a woman at home, the desire to remain pure of purpose, the thematic recurrence of blindness and the Peach Blossom. A number of the reviews I read seemed to mix up multiple characters, and without a second or third review, I can understand why. Wong Kar Wai can fit these complexities in partly because he makes no attempt to capture them on-screen. The general shape of the narrative comes from voiceovers by various characters, and the visuals mainly serve to set the tone for this exposition, and to support it by rendering the emotional content, and filling in details and drama where necessary. The visuals are thus used almost entirely to capture key moments that supply substance to the narrated plot. However, even as this approach allows an abundance of storytelling material, it also serves to obfuscate those stories, to the point where they're almost indecipherable. The first time through the film, you might think those seven characters are as few as three or four, and they may seem to change places in impossible ways. You may actually end up thinking this film is more artsy than it actually is. According to the filmmakers, this is because the Jianghu is a place of moral absolutes and human universals. The ideas driving these characters are more important than the conflicts and personalities of the characters themselves. And we see this sense of absolutism, this harsh confrontation between light and dark and loyalty and betrayal, in the way the colors infuse the landscape with harshness. This is a world without soft edges, without flexibility or nuance. It's a world where the sky meets the earth at the unbreakable barrier of the horizon. In the course of the film, three of the heroes are associated with the cardinal directions. These are Feng, the Lord of the West, Yaoshi, the Lord of the East, and Huang, the Beggar King of the North. Nobody seems to represent the South, but I think at least two characters could qualify. These are the two great warriors of the tale who never reach satisfactory conclusions: the Blind Swordsman, and Yin/Yang, the dissociative princess of the Murong warrior clan. My first choice is the Blind Swordsman, who comes from the South, but never manages to attain the other characters' fame. The Blind Swordsman is killed before he makes it to whatever kingdom awaits him, and his corpse has to speak from the ground to warn Hueng about the left-handed swordsman. The loss of his love, his status as a wandering Ronin of the Jianghu, and his association with his home in the South, where he has left Peach Blossom behind -- these all point to his status as unfulfilled Lord of the South. Of course, it's also possible that Princess Murong represents the South, for she becomes an infamous, enigmatic warrior, and her story after her night with Feng is never told. Like the men of the East, West, and North, Lady Murong pines for a lost love, and this longing ultimately drives her to pursuit of perfection and solitude... whether she earns the Lordship over that final cardinal direction is an open question. If you're already totally confused, and you're asking, "Did I even see the same movie? ", it might be because you're still afflicted with first- or second-viewing syndrome. This is the feeling this film causes that all the characters are all interchangable, and that they somehow exist in an impossible space-time continuum. Honestly, this reaction is acceptable and understandable, because it means you've already engaged Ashes of Time at the first, most important level of understanding. It only takes one attentive viewing to experience the drunken power of the movie... but if you want to untangle it on a narrative level, and appreciate the distinctive beauty of each of the characters' stories, you'll have to watch it at least a few times. I actually did my best to help with this process, by creating an extended timeline of the Jianghu of Ashes of Time. The timeline (clickable at left) takes all the little details and twists and revelations, dispensed wily nilly throughout the film, and arranges them into an order that allows them all to make sense. There are certainly ambiguities that I've overlooked or made assumptions about, but this is a good starting point. For instance, it's a striking moment when you realize that the whole ordeal with the girl and the horse-bandits... a pair of adventures that make up at least half of the movie... all take place after Yaoshi has taken the wine to forget his past. This final meeting between Feng and Yaoshi is presented early in the movie, but it seems like it happens at the end of the chronology, when it actually happens right in the middle. Using this pivot-point as a landmark... the death of a lost love and the gift of forgetfulness... I've separated the film into two chronological sections. I call the first half the "Time of Wandering." This is when Yaoshi is making his rounds, visiting Feng and his lost love in turn, bringing them news of one another. During this time, the free-spirited Yaoshi sets the stage for many of the later developments: he steals the blind swordsman's wife, he makes a false offer of marriage to the princess of Clan Murong, and he generally damages and alienates people around him, despite his best intentions. I call the second half of this chronology the "Time of Fighting and Forgetting". This is a period in which Feng, true to his calling, is cleaning up the complications engendered in the first half of the film. 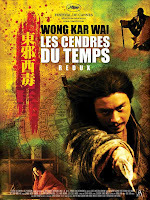 He encounters Mourang as Yaoshi, he provides a final, fatal task to the estranged Blind Swordsman, and he mentors Huang, the Lord of Beggars, who will eventually become his adversary (this destiny is barely mentioned in the film, and it's depicted with no real explanation, but all the foreshadowing is there). During this period, Yaoshi vanishes, losing his memory and eventually retiring to hermitage. This is Feng's time to start creating history. A beautiful, powerful, complex film, and at this moment, my personal favorite from Wong Kar Wai. The enigmatic structure of Ashes of Time provides a powerful lens for its intensive exploration of loneliness, longing, and uncertainty, and for its experimentation with time and space. Wait to see Ashes of Time until you're ready to really work for it... when you get there, I can assure you, it will be a rewarding experience. i very love your writing type, very charming. don't quit as well as keep penning as it simply well worth to look through it. I believe that a "lord of the south" was never represented in the film largely because the Movie is based on characters from Jin Yong's The Legend of the Condor Heroes. In Jin Yong's novel, the Lord of the south character is in fact a "king of the south", but has the least appearances of the four in the novel, thus this is probably why Wong Kar Wai decided to omit him, rather than make up an entirely new character.